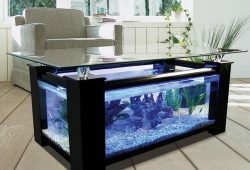 In the article you will find some basic information on The Eco-Friendly Saltwater Aquarium. To protect the marine environment, choose aquacultured materials and tank-bred animals for your saltwater aquarium, and never release anything into the wild. The April 2007 issue of National Geographic Magazine presented the alarming fact that the world’s oceans are being depleted by commercial overfishing and environmentally damaging fishing practices. Global warming and pollution are also putting our seas in peril. 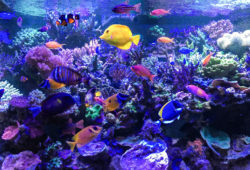 Though the saltwater aquarium trade may not be the leading cause of destruction in our seas, the coral reef environment is feeling the strain of the rise in popularity of saltwater aquariums. Some species are especially hard-hit: Seahorses, for example, are being harvested in unsustainable amounts for the aquarium trade and for use in traditional Chinese medicine. The clownfish, or anemone fish, bolstered to popularity by the Disney movie Finding Nemo, is another species being ripped out of the wild in alarming numbers. 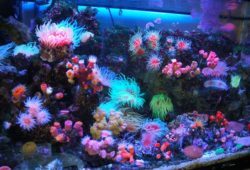 Luckily, you can easily ensure that your reef tank is environmentally friendly by following three golden rules. Use only aquacultured live rock, sand, coral, and plants. Although coral reefs occupy less than 0.25% of the marine environment, they are home to more than 25% of all known marine fish species. International trade in corals and live rock greatly contributes to the degradation of the coral reefs. Large-scale removal of live rock destroys habitat for fish and marine invertebrates and undermines the structure of coral reefs. Luckily, aquacultured live rock, sand, and even corals and plants are available. You might have to pay a bit more for a farmed reef than for materials taken from the wild, but aren’t our oceans worth it? Purchase tank-bred fish instead of wild-caught. Whereas approximately 90% of fish sold for freshwater aquariums are farm-raised, the majority of marine fish for sale are taken from the wild. Many reef fish come from coral reefs in the Philippines and Indonesia, where trade is largely unregulated. Local fishermen often use cyanide to stun fish and make them easier to catch, though less than 1 in 10 fish survive a cyanide stun. Also, cyanide damages surrounding coral and marine life not targeted for capture. Luckily, many popular species of aquarium fish are being aquacultured, including seahorses and clownfish. Tank-raised fish have the advantage of being used to water conditions in the common aquarium, they are not stressed by proximity to humans, and they easily accept commercial fish foods. Never release your aquarium fish, corals, plants, or live rock or sand into the ecosystem. Never flush a live organism or pour an organism down a drain–you don’t know where it may end up. There have been several cases of released organisms becoming full-blown “invasives.” One of the most famous recent examples is the venomous lionfish, a Southeast Asian native now causing concern in the Bahamas and off the coast of Florida.